Liverpool defender Jamie Carragher has announced that he will retire at the end of the season. The 35-year-old has made more than 700 senior appearances for Liverpool, and is second only to Ian Callaghan in the club's all-time appearance table. Carragher, who won 38 caps for England, will leave the club in the summer. "I'm making this announcement because I don't want the manager to be answering questions when I've already decided what I am going to do," he said. Made his debut against Middlesbrough in January 1997 at the age of 18. Scored on his Anfield debut later that month against Aston Villa. Has made 723 appearances for Liverpool, the second-highest behind Ian Callaghan's 857. Won two FA Cups, three League Cups, two Community Shields, one Champions League, one UEFA Cup and two Super Cups. Made his England debut in April 1999 as substitute against Hungary. In 2007 he retired from England duty, but returned under Fabio Capello for the 2010 World Cup. Carragher, who was out of contract at the end of the season, joined Liverpool's youth system aged nine and made his first-team debut against Middlesbrough in January 1997. He was part of the Reds side that won the Uefa Cup in 2001 and Champions League in 2005, and picked up two FA Cup winners' medals and three League Cup titles. 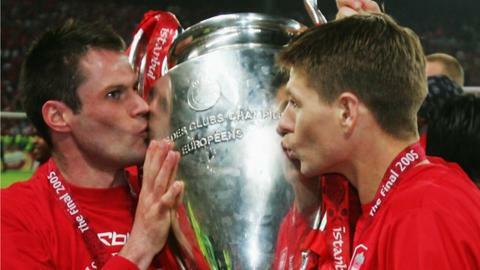 "It has been a privilege and an honour to represent this great club for as long as I have," said Carragher. "I won't be making any further comment on this decision until the end of the season - all our focus and concentration should be on achieving the best possible finish in the league this season and trying to win the last remaining trophy [Europa League] we are competing in." Former Liverpool manager Kenny Dalglish paid tribute to Carragher's contribution to Liverpool. "Sad day for Carra announcing his retirement. He'll be missed but he can be very proud of everything he's done for Liverpool," Dalglish tweeted. Although the Liverpool statement announcing Carragher's retirement said he will leave the club at the end of the season, Reds managing director Ian Ayre hinted the player may still be given a future role with the club. "Everyone within the game knows that Jamie has been a colossal figure for Liverpool," said Ayre. "You don't have a career spanning three decades at the very top of this game unless you are an exceptional player and he epitomises the values this club was built on and continues to stand for. "In line with Jamie's wishes we will wait until the season concludes before giving him the true recognition he deserves. We will also wait until that time to comment further regarding what involvement he may have with the club going forward." Manager Brendan Rodgers, who said in January he wanted Carragher to remain at the club beyond his current deal, says the centre-back will continue to feature in his plans between now and the end of the season. "Jamie has been absolutely outstanding for me since I joined the club," said the former Swansea manager, who took charge at Anfield last summer. "He will have a significant role to play for us between now and May." Carragher has been a mainstay in the Liverpool defence for a decade, and ex-Reds midfielder and team-mate of Carragher, Jason McAteer told BBC Radio 5 live that was a testament to his professionalism. "He's been around so long, he's been absolutely fantastic for the football club," said the former Republic of Ireland midfielder. "He knuckled down under [former manager] Gerard Houllier and changed the way he played. Rafa [Benitez] made him a centre-half and he took to it like a fish to water. "He reads the game extremely well. His organisation skills are certainly there. He's still got life in him yet. I hope Liverpool keep hold of him in some capacity. I think he's a dying breed, he's tough and knows Liverpool inside out." Ex-Liverpool and England striker Michael Owen also paid tribute to his former team-mate, tweeting: "A rare breed and it's been a privilege to play alongside, room with and be big mates with one of football's real men." He later told BBC Radio 5 live: "He's got a special place in my career and in my heart and we had some great times together. I was fortunate to be able to play with Jamie at the early part of my career. We broke into the team at a similar age and roomed together for about 6 or 7 years." On Carragher's possible future management plans Owen added : "I'm sure he's capable. He knows everyone in every single league, he's certainly got the credentials. It's whether he wants to do it and I'd hazard a guess that he would." Manchester United defender Rio Ferdinand added on Twitter: "Jamie Carragher has been a great servant to LFC. Great player and a top fella! Funny guy! Nutter when we were kids but management material now."